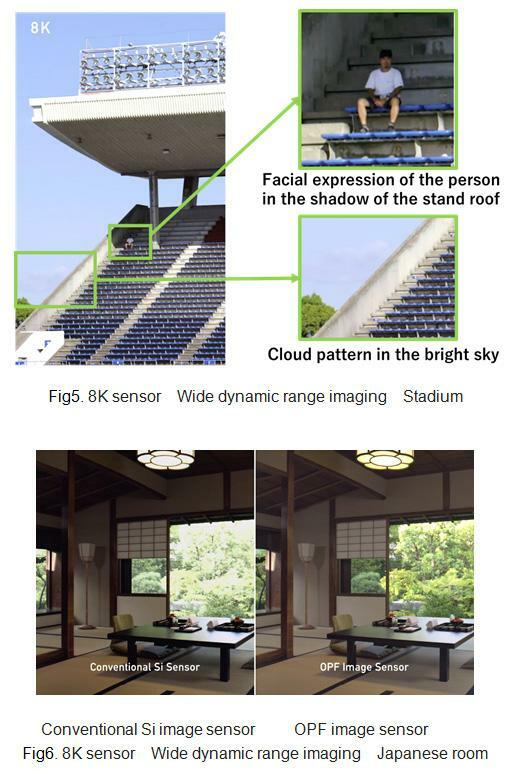 WOW: Panasonic Develops Industry’s-First 8K High-Resolution Global Shutter organic sensor! 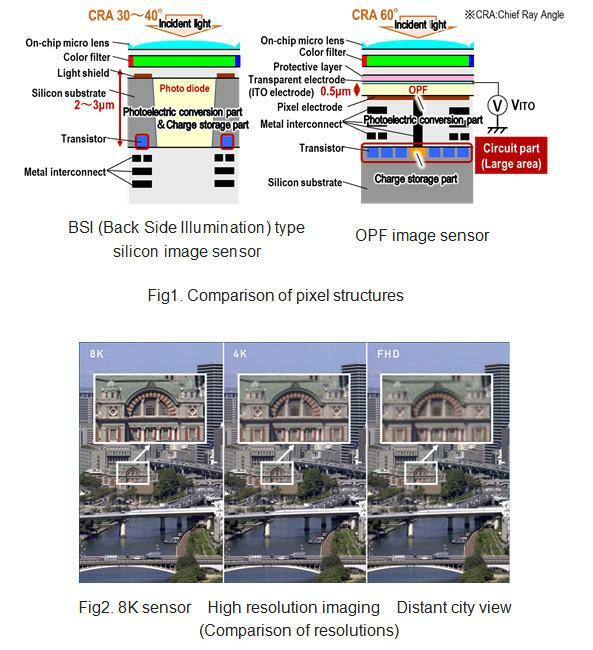 Osaka Japan, – Panasonic Corporation today announced that it has developed a new technology which realizes 8K high-resolution (36M pixels), 60fps framerate, 450k high-saturation electrons and global shutter  imaging with sensitivity modulation function simultaneously, using a CMOS image sensor with an organic photoconductive film (OPF). In this OPF CMOS image sensor, the photoelectric-conversion part and the circuit part are independent. By utilizing this OPF CMOS image sensor’s unique structure, we have been able to newly develop and incorporate high-speed noise cancellation technology and high saturation technology in the circuit part. 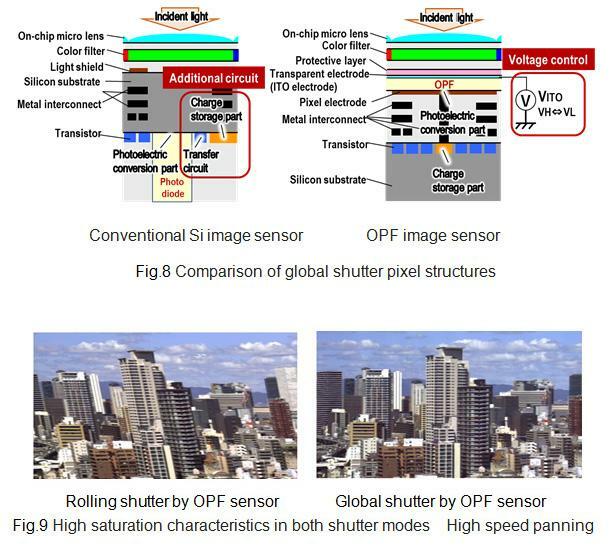 And, by using this OPF CMOS image sensor’s unique sensitivity control function to vary the voltage applied to the OPF, we realize global shutter function. The technology that simultaneously achieves these performances is the industry’s first*1. Panasonic will present some of these technologies at the international academic conference: ISSCC (International Solid-State Circuit Conference) 2018 which will be held in San Francisco on February 11 – 15, 2018. 1. “OPF CMOS image sensor design technology”, in that, the photoelectric-conversion part and the circuit part can be designed independently. Because the OPF CMOS image sensor has a structure in which the OPF and the charge storage part are connected by metal plugs, accumulated charges cannot be completely read out. Therefore, there is a problem that it is affected by reset noise at the time of resetting the pixel (signal charge storage node). And, in a high-resolution sensor, such as an 8K sensor, it is necessary to drive large loads exceeding 4000 pixels aligned in the vertical direction at the same time as the time of noise cancellation, and therefore, the long time it takes to suppress noise is a problem. 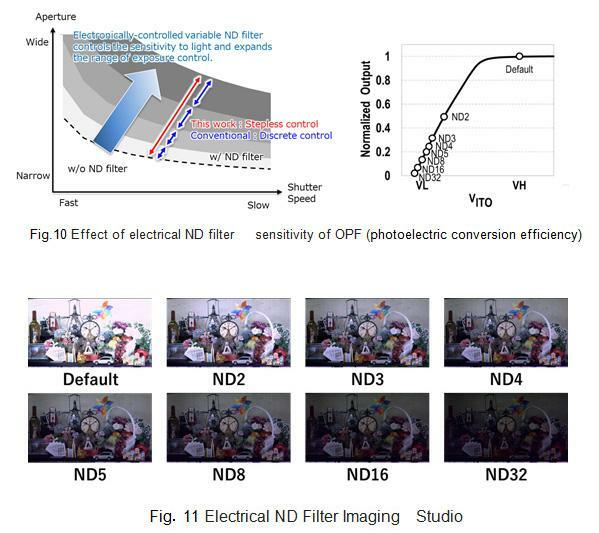 So, we developed a new structure that cancels pixel reset noise at high speed, even when high resolution pixels have to be driven, by using Panasonic’s original semiconductor device technology and the newly developed “in-pixel capacitive coupled noise canceller”. In this structure, the reset noise is suppressed at high speed by using the negative feedback loop provided for each pixel. 4. “Voltage controlled sensitivity modulation technology” that can adjust the sensitivity by changing the voltage applied to the OPF. 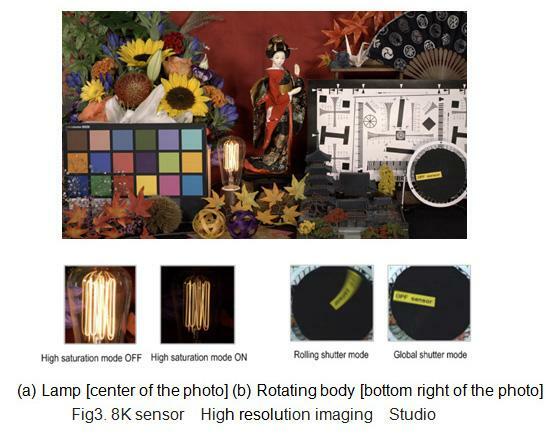 By controlling ON / OFF of the voltage applied to the OPF and controlling the sensitivity of the OPF, we realize the “global shutter function” capable of imaging all pixels at the same time, even driving a large number of pixels like the 8K sensor. By capturing with the global shutter function, as shown in Fig. 3 (b-43rumors), the letters on the rotating body are read sharply without distortion. In addition, as shown in Fig. 7, even at the time of high speed moving object capturing, such as when driving on a highway or at industrial inspection, capturing without distortion becomes possible. In the conventional global shutter type silicon image sensor, it is necessary to add new elements such as transfer circuits and charge storage capacitors in order to accumulate charges simultaneously in all pixels. As a result, the area of the photodiode and that of the additional circuits must compete for space, there is a problem that the pixel size cannot be reduced and the amount of saturation electrons cannot be increased. On the other hand, in the OPF CMOS image sensor, since there is no need for additional elements, it is possible to realize small cell, high resolution sensors, and by incorporating large capacitors in the circuit part with a large available area, accurate imaging with no distortion from dark scenes to extremely bright scenes is possible. For example, as shown in Fig. 9, with the OPF CMOS image sensor, when buildings are photographed while panning [5-43r] at high speed, even in scenes with high contrast like a bright sky and dark windows, it is possible to acquire image data maintaining all gradations of the whole area without distortion. previous post: Panasonic GX9 and ZS200 officially announced!